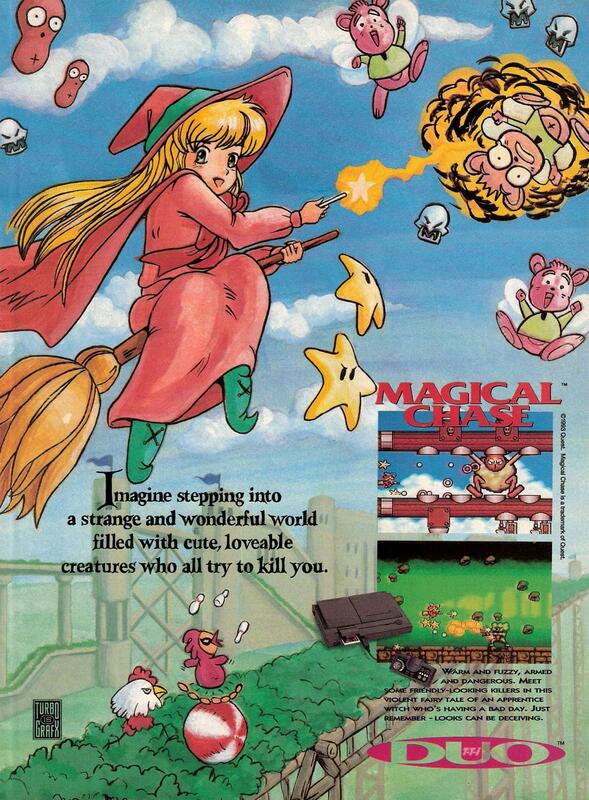 Magical Chase is another one of those quirky, but in this case excellent, games released for the TurboGrafx-16. The game is basically a side-scrolling shooter but it is a bit unconventional in that you take the roll of a young witch in training riding a broomstick instead of the typical spaceship, jet fighter or other aircraft. You must catch the demons you accidentally released or your mentor will turn you into a frog. The game plays like a fairly typical horizontal shooter but the theme is unique and the graphics well done. If you like shooters you should love this game. The only problem is that this game was released in late 1993, very late in the life of the TurboGrafx-16 / Duo. It is one of the rarest and therefore most expensive games for that system. And while there is a slightly more common Japanese version of the game, there are some fairly significant differences. 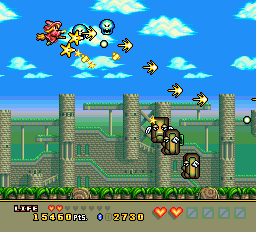 Many of the sprites and most of the first level were changed for the North American release. It’s a good game but I don’t know that it is good enough to warrant the premium price you would have to pay for an original copy. 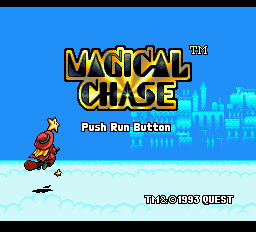 The TG-16 version of Magical Chase has not been re-released but there were a couple of other ports over the years. Apparently, there was a version released for Windows 95 in 1998 but I believe this was a Japan only release. There was also a pretty good port for the Game Boy Color in 2000 if you want to play it on a small screen but this was also a Japan only release. Cotton, an unrelated but similarly themed (and also relatively rare) game was released the same year as Magical Chase for the TurboGrafx-16. However, if you want to play the TurboGrafx-16 version of Magical Chase, you’ll probably want to do it via emulation unless you want to shell out the big bucks.